The rich finish and angular contemporary design of the "Deagan"accent table collection come together to create furniture that fits flawlessly into the decor of any living environment. 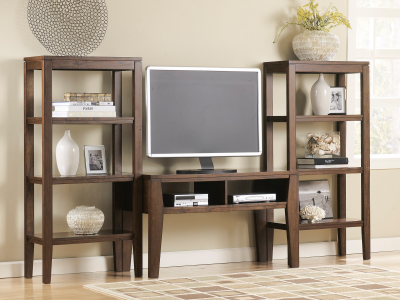 The rich dark brown finish flows beautifully over the straight-lined contemporary design and the angled legs to make this furniture stylish as well as functional with the ample amount of shelf storage this collection offers. With the addition of the clear beveled glass insert adorning the cocktail table top, this collection captures the true essence of great contemporary design. Enhance the beauty of your home's decor with the style and function of the "Deagan"accent table collection. 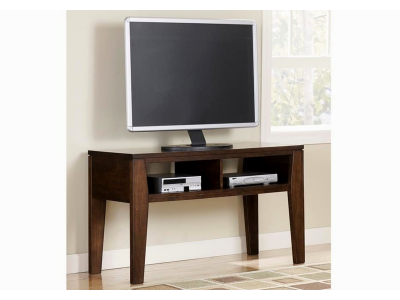 · Made with select veneers and hardwood solids in a dark brown finish. · Angled legs support the shelf.